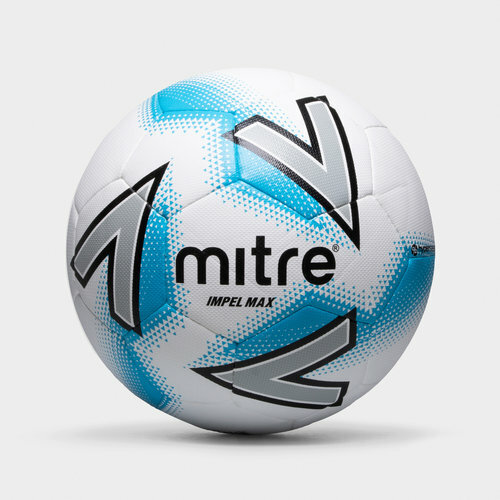 Test your limits in training when you use this Mitre Impel Max Training Football in a White, Silver and Blue colourway. This football from British sportswear and equipment manufacturer Mitre is a top-level training ball. Coming from a company that is the world's oldest sports manufacturer means the ball alongside any sporting goods have been crafted from experience. Existing for over 200 years means Mitre know what it takes to produce excellent equipment over and over. This ball has been crafted with an efficient and hard wearing 30-panel construction to ensure consistent and long-lasting performance during intense training sessions. It has been constructed with the 'Vimini' outer texture for an enhanced grip and control to ensure player confidence and improve their skills. The 4.5 mm EVA soft-touch foam backing enables players to comfortably control and play the ball - inspiring youngsters to and ensuring confidence on the ball. This ball has increased durability through a PU outer material to resist constant use and offer superb performance. It's engineered with revolutionary Hyperseam technology for almost zero water uptake, helping the ball last in any weather.